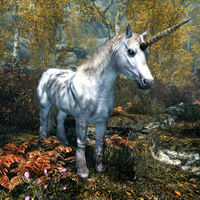 The Unicorn is a unique horse which can be found near the pond just west of Lost Prospect Mine during the related quest. It is a wild horse and must be tamed by continuing to mount it until it breaks. Once tamed, the Unicorn becomes an owned mount. If you switch to a different mount, it will slowly make its way to the College of Winterhold courtyard. Creature of Legend: Track down and tame the last living Unicorn. According to Soran's Journal, this Unicorn was brought forward in time by the Psijic Order after the species went extinct during Hircine's quest in Oblivion. As such, it is supposedly the last Unicorn in existence. This page was last modified on 20 October 2018, at 20:10.